Your contributions benefit your missionary in vital ways. Every missionary has unique financial needs based on their individual circumstances. Family size, country of service, type of ministry, and personal needs are some of the factors we consider when building a budget for a missionary. When you give to a missionary’s support account, you are giving to an account that is divided in many ways to meet these specific needs. NOTE: PERCENTAGES REPRESENT AN AVERAGE MONTHLY SUPPORT BUDGET FOR A FAMILY WITH TWO CHILDREN. SALARY, HOUSING, AND TAXES: Your missionary’s salary requirements include funds to cover basic living needs, foreign and U.S. taxes, Social Security tax, and children’s education. This covers costs for their time in their country of service, as well as home assignment time back in the United States. HEALTH INSURANCE: Your support dollars also pay for your missionary’s health insurance. SIM has a global health plan that covers people no matter where they serve. It also includes medical emergency evacuation. In an emergency, this helps us ensure the safe evacuation of a missionary in need. This is a vital part of caring for our missionaries well, though we pray we do not need to use it. RETIREMENT: Care for future needs is also included as we build in an amount that is invested every month into a retirement account (403(b)) with a major mutual fund company. We work to help them adequately plan for their years after service on the field. Financial planning is simply a wise decision for anyone to make, including our missionaries. HOME AND FIELD SERVICES: A portion of their requirement also goes to cover administrative expenses involved in running a mission organization and supporting the work of hundreds of missionaries around the world. The services include tax and legal costs, receipting and banking, accounting and audit, recruiting and training, communications and technology, member care and counseling, project management, and many more vital support services. INTERNATIONAL TRAVEL EXPENSES: As part of their support requirement, we also set funds aside for travel costs to and from their place of ministry. This ensures that they always have funds available to come home when their term is finished, in order to not create a financial burden on the missionary (and family). 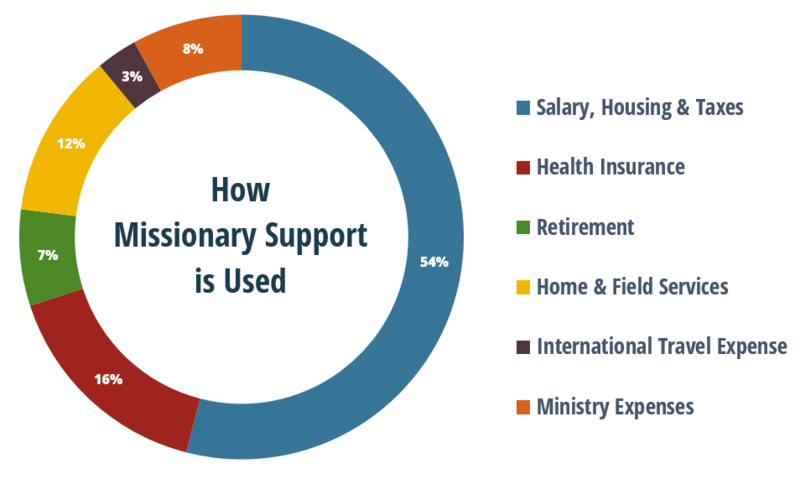 MINISTRY EXPENSES: Some (not all) of our missionaries include monthly ministry expenses as another line item in their monthly support budget. This is the case if you see an option to give only to your missionary’s support account. By giving to their support account, you can rest assured that they will have funds available for ministry activities. Click “Missionary Ministry Accounts” to see a full description of ministry funds. Outgoing (One-Time) Needs: Newly appointed missionaries will have one-time outgoing needs prior to leaving for the field. These needs may be met by way of gifts designated for their support account. Missionaries are also able to raise funds specially designated for the cost of their ministry. These funds are similar to what are considered business expenses in the corporate world. Ministry funds help with items like teaching supplies or Bible study materials, medical or construction tools, and costs of travel to mission outreaches. These funds can also be utilized in the support raising process and communication to donors of their ministry. If you do not see the option to give to your missionary’s ministry account, it’s because they have included ministry expenses within their support budget. Your gifts to their support account will help to meet these needs. Ministry activities with more substantial costs are funded through SIM projects. Our projects help accomplish important ministry needs such as well water drilling, responding to refugee crises, providing relief and development services, education, medical care hospitals and rural clinics, veterinary care, agricultural techniques, and more. Our three-pronged approach is to respond to need, proclaim the gospel, and equip the Church. Your gifts given to these projects help us meet these needs all over the world. SIM greatly values financial integrity. As members of the Evangelical Council for Financial Accountability (ECFA), we manage our resources according to biblical standards, as well as U.S. tax law. Financial integrity includes accountability and transparency, both of which are important aspects of our projects system. Each project reports regularly on the use of funds and the achievement of ministry objectives. SIM has hundreds of ongoing projects around the world. Our projects system is designed to help meet needs and also give comfort knowing that resources are being used wisely and effectively. A small percentage of every gift goes toward service fees. The fees that are applied vary depending on where the gift is sent. These fees make our ministries possible by contributing toward the cost of managing our projects, including administrative overhead.